Collection of non-scripted user-made habbo posters . created by: Promiscuous? | Please Obey the habbo way, rate, join and enjoy! Recording music group. F.E.E.L | The sounds of new culuture Hip-Hop/ Rap. So you wanna be part of the Streets? Well good we are the STREETS OF New York! This is the badge for all people who auction here at Trade City! Welcome to the group! By .XxSpadExX. Grand Theft Auto RP is based in Los bobba, (name)-(role)-(job)-(item). Rules 5 - 7+ 1 typo, nothing less than 5+ or its counted as a void. You can join a bobba, create your own bobba do missions/heists and etc commit crimes do what ever. Conventional improvisational comedy games are injected with a hip-hop flavor as host Mani Nneji and celebrity guest stars lead teams of comics in a series of comedy challenges. Bringing together the Habbo community. HMH provides medical and surgical treatment and nursing care for the sick or injured. We offer nothing but the best care and treatment for our patients. 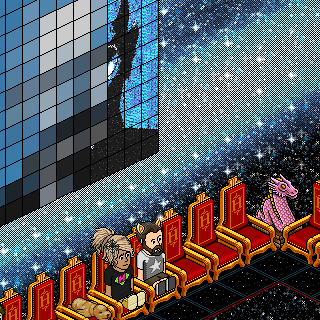 Habbos got talent now on!!! Looking for one of the best spots to increase your achievement score? Well you've just found it. This booster contains Banzai, Freeze, skating, and much more! º For all you Fans of Lady Gaga.. You were BORN THIS WAY. Don't let ANYBODY get you down. We are a Diverse Culture... Take every moment.. and MARRY THE NIGHT ƒ PAWS UP. Taken in this room on 31 July 2017 and received 3 likes.